Compressed air connectors are part of the compressed air fitting tag-team of couplers and connectors. This page focuses on connectors. There is the page on this site that provides detailed information about couplers too. For us DIY folks, and for a lot of industrial plants that use compressed air, one of the most common fittings we will use is the compressed air connector. The purpose of compressed air line connectors is to mate with a matching coupler on an air supply line and to facilitate secure connections between the two. This to allow compressed air to flow through to the air tools or air-using components in the workshop or plant. Since air line connectors are inexpensive devices, each costing a dollar or two at most, using them abundantly for quick connection of your air tools is the way to go. Thread a connector into the supply port of every air tool you’ve got, thereby making them ready for immediate use. By having a connector installed in every air tool in the shop, changing your supply air hose from one air tool to another is simple and fast. Unplug one tool air connector from the air line coupler, and insert that of another air tool into the same coupler on the same air line and you are back in business. Typical air line connector, this one with a male thread. A typical connector is shown in the photo above. On this connector an NPT male thread is on the left end. On the right end of this connecgtor is the part of the connector that plugs into the matching coupler. This is a manufacturer specific connector shape, meaning that this connector shape must correspond to, or match the design of, the coupler into which it is inserted. Images of some common connector configurations follow. Item 1 in the photo is a connector with a male NPT thread. 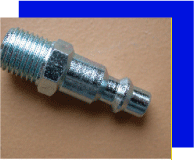 After coating the male threads with thread sealant, this connector can be threaded into the mating female NPT threaded hole in an air tool or any device needing an air supply. 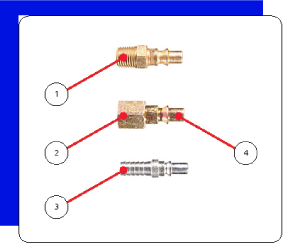 The male NPT threaded connector is the most popular method of connecting an air tool to a compressed air supply. Have an abundant supply of these on hand to quickly thread one into any additional tools acquired. Item 2 shows the same connector with a female NPT thread, allowing this connector to be turned onto a male thread. Item 3, still talking about the photo of the connectors above, is the same connector again, but this one comes with a barbed connector, used by inserting the barb into the I.D. of an air hose. A gear clamp is then placed on the outside of the hose which has been pushed up and over the barb, with the barb inserted fully inside the hose. When tightened, the gear clamp will exert force around the entire outside of the hose, compressing the hose wall against the barbs, and making a secure seal. All three of the connectors formats above are industry standards. Two have standard NPT threads. Item 3 in the photo has an industry standard barb. The barb end is sized by its O.D. measurement. Therefore, a 1/2″ barb would fit into a 1/2″ I.D. hose. For me, just a few of items 2 and 3 are enough for my air tool kit, as I use the male format (item 1) most frequently. The methods of installing a connector into an air tool or onto an air line are common, and are shared by many manufacturers of connectors. Item 4 in the photo below is an issue to be considered. The right side shape and size of the connector shown in the photo above could be proprietary. This means that the design of it may be unique to a specific manufacturer’s brand. Or, it could be built to emulate another company’s coupler design or to meet an industry standard. This is the part of the connector that has to match the size and shape of the inside of the mating coupler. If it does not, you may not be able to insert the connector into the coupler at all. Or, if you can insert the connector and it is the wrong design, at best the connection will leak, and at worst, the connector could blow-off from the coupler, usually at the worst possible time. There are many different styles and sizes of connector configurations available in North America, and around the world, and, as noted, not all are interchangeable. As a result, you have a decision to make when it comes to selecting connectors, and the mating couplers. Your compressor may have come bundled with a fitting kit of some sort, similar to the one shown below. This kit has the coupler on the left, a connector with a female NPT thread, the same connector with a male NPT thread, and a male-to-male adapter. You could simply use the kit that came with your compressor, buy no others, and be able to use your compressor and air tools but perhaps with a bit of difficulty, as you may not have enough connectors to go around to all the air using devices you may have. 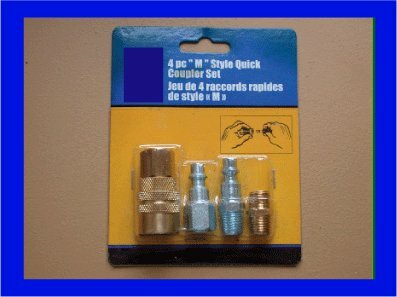 If a coupler / connector kit came with your compressor, ask the store clerk to identify their store brands that match those in the coupler/connector kit. Consider buying a number of couplers and lots of connectors of the same brand / configuration at that time. If it were me getting my new compressor, I would pick up at least a dozen connectors and half-a dozen complementary couplers so that I had extras when I needed them. And yes, I expect you will need them. We compressor users like our air tools and as mentioned, it is a whole lot faster to change tools when you have a connector already threaded into the air tool intact port and one or two extra, ready to thread into the next air-using toy you acquire! Compressed Air Connectors questions? Please add your comment here along with photos to help others help you with your compressor and equipment problem!